Flyers are perhaps the simplest form of print marketing and are used to generate new business and communicate product features and options. Flyers can be sent by direct mail, used as newspaper inserts and handed out at trade shows. Even though they are easy to produce and inexpensive, be sure to design well. 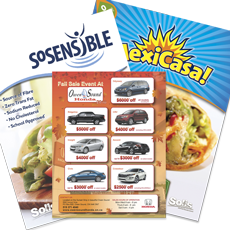 Flyers and sell-sheets are perhaps the most common print-based marketing and information tool. We offer them in a variety of sizes, paper types and finishes to suit every budget. Sizes available include: 5.5″x8.5″, 8.5″x11″, 8.5″x14″, 11″x17″, 12″x18″, 13″x19″ and most sizes in between.